The Ober Gabelhorn is described by the guidebook as ‘the most beautiful mountain of all the mountains in Valais’, it is clear to see why when making the drive up from Zinal. 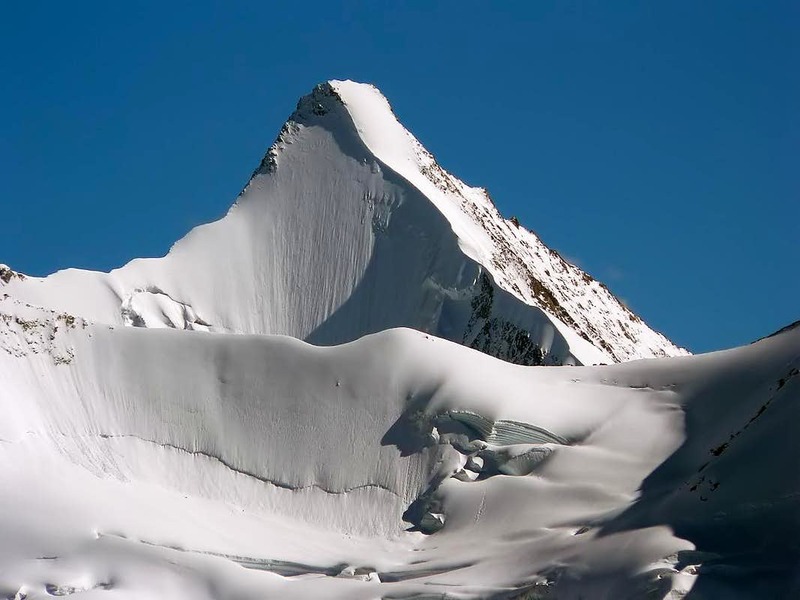 If you asked a child to draw a mountain they would draw it like the Ober Gabelhorn – a perfect snowy pyramid steep on each side leading to an abrupt summit. Having had a week of cold and snowy conditions up high in the alps we were confident there would be good snow covering on the North face to climb, but as it is the middle of July we were less confident there would be good conditions to ski. We decided to take the skis just in case and ski the face only if it was in good condition. The walk up to the grand Mountet hut is a long and beautiful one ending in and incredible cirque of mountains including the Dent Blanche, Wellenkuppe, Zinal Rothorn and the Weisshorn. Without a doubt though the most impressive is the big face of the Ober Gabelhorn. We decided to make an early start waking at 2 and setting off at 3am which would give us enough time to climb it and then hopefully the best conditions to ski when the snow softens a little. It was an amazing morning with the moon lighting up the face and a clear sky. We walked, scrambled,and skied across to the face taking around an hour from the hut. Put the crampons on and started to climb around 4am. We made quick progress up the face on easy ground and good neve getting to the half way point around 6am when the sun rose lighting up the summit pyramid. A really beautful morning and a stunning looking mountain. Here we started up the main face soloing up 55’ slopes again on good snow. The thought of having to ski down something I was using 2 ice axes to climb up was starting to weigh on my mind and I was getting a little nervous! It seemed to take forever on the face with the altitude kicking in and the angle steepening. We took the rope out just for the last 30m of the face to pass the cornice, which took us onto the final slope for 100m to a very small summit. We reached the top at 9am and enjoyed the incredible views toward the Matterhorn North face, which looks in pretty good condition at the moment. We decided the snow was in good enough condition to ski so we shuffled around to get our skis on then made some exposed turns down the summit arete on 45’ slope before dropping onto the main face. The sense of exposure looking down the main face was terrifying, Until we had made the first turn it appeared too steep to be able to ski, the consequence of a fall on the face could be fatal. After making some turns and discovering that I could ski a 55’ slope my confidence came back along with my technique and could enjoy some steep turns down the face. The snow wasnt great, quite crusty but not bad considering it was July. I was extremely relieved to make it off the face and onto some easy ground before the steep finish down the final slopes. The rest of the ski went without incident and we were pleased to get back to the hut for some soup and a beer. We were congratualted by the guardian who had been looking through binoculars of us descending the mountain. We just had a long walk out with heavy packs to end an incredible couple of days climbing and skiing a classic line, on a beautiful mountain.